Yet another crisis meeting at the home of Prime Minister Erna Solberg has failed to end her minority government’s budget stalemate with its two support parties. They still won’t support the budget, meaning Solberg still faces the prospect that her minority government coalition can collapse less than a year before the next national election. Leaders of the two parties that broke off budget negotiations with the government earlier this week were questioned over why they accepted the last-ditch invitation from Solberg to meet for more talks. Four days remain until the government is expected to finally deliver a budget for debate in Parliament. The government must have support for it, otherwise Solberg will likely need to formally request a vote of confidence. If she fails to win majority support for her Conservatives-Progress Party government, it most likely will fall. Hareide repeated on a live nationwide radio news program Wednesday evening that “we have said very clearly to the government parties that our door is open 24 hours a day.” The Christian Democrats leader added that “we have even said we’ll be open on Sunday,” a reference to just how far a party that consistently opposes stores being allowed to open on Sundays was willing to go to “constructively” negotiate a new budget. During the pre-Christmas shopping season, though, stores (and his party) are allowed to open on Sunday. Many commentators claim the government parties, especially the Progress Party, have painted themselves into a corner by refusing to negotiate their package of proposed fuel- and other taxes on driving. The Liberals have fought for higher taxes, to discourage driving and therefore cut carbon emissions. Many other politicians, including several in opposition and even within the Christian Democrats, claim the taxes won’t cut emissions enough to justify the budget crisis that’s arisen. The Liberals, however, appear just as adamant against backing down as the Progress Party. 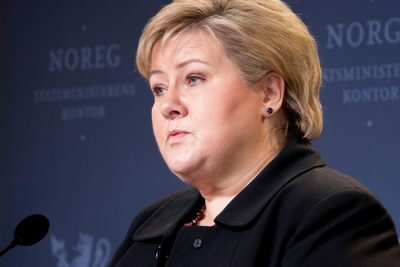 Solberg claims her government’s budget will cut emissions and also make Norwegian business more competitive and improve social welfare programs. She said the Conservatives and Progress parties have presented additional proposals to appease their support parties that would help familes with small children, provide more teachers in the schools and support Norway’s outlying districts. She didn’t assume any direct blame for the budget crisis herself. Shortly after the party leaders left Solberg’s home late in the day on Wednesday, top politicians who’ve been negotiating on behalf of the Conservatives and Progress parties arrived for a short meeting of their own with Solberg. Then Solberg herself emerged, on her way to appear on NRK’s nightly national newcast Dagsrevyen. “We have discussed the situation we are in, without an agreement on the budget,” Solberg told reporters Wednesday evening. “And we have discussed how this will be handled further.” No additional developments had been made public as of mid-day on Thursday.